As I was planning a work trip to San Diego, I thought I’d look for some places where I could go longboard skateboarding during my stay there. After some research, I found quite a few good places to go riding. Awesome longboard spots for flatland cruising and distance pushing can be found all around the city including the endless bike trails of Coronado Island, Mission Bay, and Balboa Park. 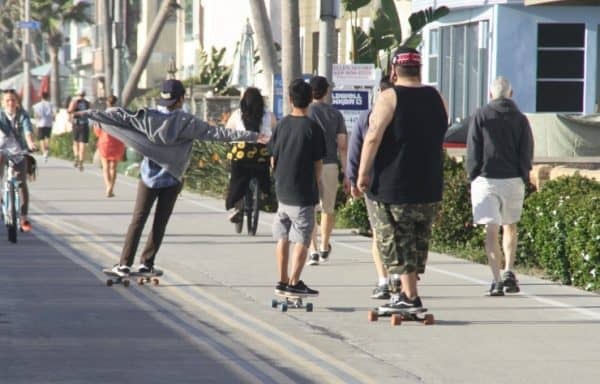 The multi-mile boardwalk along Mission Beach and Pacific Beach can also be great places for longboarding – except perhaps on very crowded days. San Diego also offers many great spots for longboard freeriding and downhill, such as Black’s Beach, the UCSD campus, and Mount San Miguel. In the rest of this post, I’ll share some of the best places I found for cruising and skogging, freeride and downhill, and skatepark riding. I’ll also give a brief summary of San Diego’s main laws and regulations regarding longboarding in the city. The best spots for cruising and distance skating on your longboard stretch along the coast from La Jolla up North all the way South to Imperial beach. Around the San Diego Bay, the Silver Strand Bikeway on Coronado Island has long stretches of flat, you can cruise on smooth and wide bike paths with both straight pavement and some curves, all the way down to Imperial Beach. This is up to a 12-mile round trip longboard roll, though you can turn around anytime and go back. The scenery is cool and relaxing, the path is great for longboard pushing and “skogging” (short for “skate jogging”, referring to distance fitness longboard riding) with some mellow inclines as well. Minimal and minor traffic signal crossings, and not many joggers or bikes. If you’re a newer rider, be careful not to let your longboard run away and fall onto the rocks and into the bay since there are no guardrails along the bike paths. The Strand paths can get a bit crowded but much less so at night, when you can get a pleasant longboard ride along the bay. If you go at night, park your car at the ferry landing since the park’s parking lot gets closed at night. Another great path is to start at Harbor Island Drive North of Coronado, ride your longboard South through downtown San Diego and parallel to the 5 freeway, then ride West into Coronado (either through the Coronado bridge and Tidelands Park or through Imperial Beach if you’re up for the distance) and back up North all the way to Harbor Island through the ferry ($5 one way). Further North and East, you can longboard in Balboa Park for an enjoyable longboard ride – even though it can get crowded. You can cruise on the walkways and enjoy the nice scenery there. Preferable use bigger softer wheels for your longboard as the terrain is not as smooth as the bike paths. If you’re a newbie, this is a safe place to ride due to the abundant grass to roll onto for quick stopping. The Mission Bay area is another great place for longboard cruising and skogging. You can start your path near the Information Center on Mission Bay Drive at the end of Clairemont Drive and ride to the Hilton Hotel and around Fiesta Island and Mission Bay. That side of the bay has a long stretch of boardwalk that’s much more mellow and less crowded than other parts of the bay. The boardwalk that runs along Mission Beach and Pacific Beach all the way up to La Jolla is another scenic longboard ride, a 3-mile stretch from Palisades Park all the way to the South Mission Beach pier. You can also head South of Mission Beach to for some nice distance longboarding sessions between Ocean Beach and Point Loma as the area has some great walking and bike paths. Another good area for longboard cruising is North of Mission Beach around the streets of La Jolla for some nice scenery and even some light hill sections further East. There are plenty of great hills to freeride on in and around San Diego, from mild to steep. Rutgers Roadon the South Side of Mount Soledad is one such popular hill among longboarders. Another famous San Diego longboard spot is the hilly road that accesses Black’s Beach (on the North coast of San Diego) from La Jolla farms. A great hill to ride, some say this by far the best longboard freeride spot in San Diego. While skating the road, be careful not to hit a surfer walking down or back up the road. The UCSD campus also has some very nice freeride longboard spots. You can bomb the main street UCSD is on. For milder freeriding, you can start at the front door of the Seuss library and ride all the way to the engineering buildings in Warren, a long ride with a nice mild slope. Millar Ranch Road off of the top of Mount San Miguel is also a fantastic longboarding road. However, you’ll need to walk up to the top as cars are not allowed. Also the road has a lot of speed ramps between the big gate and the radio antenna, so it’s best suited for experienced longboarders. You can see some pictures on this bike blog. Mesa Grande Road going toward the 76 East of Lake Henshaw is another great longboard freeriding spot. It has about 2 miles of smooth asphalt downhill with lots of nice curves a few cars as the road only goes up to some farms. South of Ocean Beach, the Sunset Cliffs area also has mellow and steep hills to longboard freeride on. Novara Street, for example, has a moderate hill with little traffic and a lot of nice routes. Hill Street (as the name suggests) also offers a very steep downhill ride reserved for experienced longboarders. Hollandia Park also has a long hill with grass on the sides for safe stopping on your longboard. On the outskirts of San Diego, Cowles Mountain trailhead in Golfcrest Drive has epic mountain roads for freeriding. The North Country around San Marcos and Carlsbad also have some amazing hills around the fire access roads. If you’re into park riding on your longboard, there’s a quite large number of skateparks in and around San Diego. Here are a few I know for sure you can longboard at without any hurdles. Ocean Beach Skatepark (Robb Field): you see the park as you enter Ocean Beach from the North or the end of freeway 8. Poway Skate Park: by the library off Poway road. Helmets and pads are required. Coronado Skate Park: located in Tidelands Park, this is a clean and smooth skatepark with some pools and an open area for practicing transitions and carving. Entrance is $10 the first time and $5 after that. Longboarders and skaters 18 or older have to wear a helmet though pads are optional. You can have the park almost to yourself between 1pm and 4:30pm, and the park is usually not crowded on Sundays, great for practicing freely. Carmel Valley Skate Park: it has numerous transitions and flow lines. The park is very quiet in the morning, very safe thanks to the Police Station next to it, and with very clean bathrooms. The park also has a huge pool for swimming. Pala Skate Park: North of San Diego past Escondido, about 5 minutes from the Pala Casino. At least a helmet is required (possibly pads too). San Marcos Skate Park: if you go freeride the long hill in Hollandia Park, you can also hit the Skatepark inside. Anyone under 18 is required to wear an ASTM or CPSC certified helmet when longboarding on a street, bikeway, public bike path, or trail. 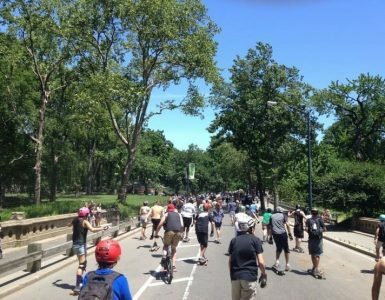 You can’t longboard on open roadways, sidewalks and public plazas in business districts, or inclined surfaces of parking structures which have no-skating signs. You can’t longboard on the boardwalk between Mission Beach and Palisades Park or in adjacent streets past 10pm and before 7am. If you’re longboarding on a pedestrian street or sidewalk, you must not exceed reasonable speed and you must always give pedestrians right of way. You can’t longboard in school districts that prohibit skateboarding and similar activities. Children under 12 must be accompanied by a parent or guardian when at a skate park. Skaters must be in full safety gear to use a skate park. This means helmets, knee pads and elbow pads designed for skateboarding. No alcohol, smoking, food, drink, or glass containers are permitted inside the skate park. Graffiti and littering in the skate park are prohibited. Any unauthorized jumps, obstacles, or ramps are prohibited inside and outside the skate park. Animals are not allowed in the skate park.